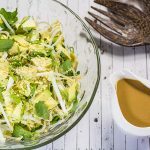 Our Simple Low Carb Salad with Peanut Dressing is a fresh, Asian style coleslaw that will tantalize your taste buds. It is vegetarian and vegan friendly – a great salad to bring to a picnic or potluck. In a large bowl combine the chinese cabbage, bean sprouts, cilantro scallions and avocado. Mix well and divide among 4 dishes. In a smaller bowl combine all the dressing ingredients and whisk until completely combined. If the dressing is too thick add a little more water. Drizzle the dressing over the salads, sprinkle with sesame seeds and serve.